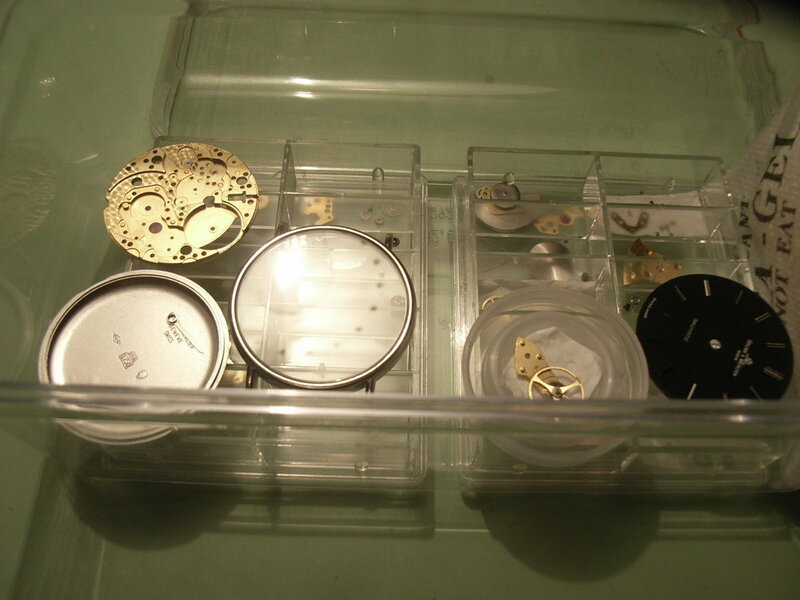 Here a friend´s Baumatic watch with a missing crown - I already got it months ago to repair it, but it took me a long time to get all the necessary replacement parts to finish it. 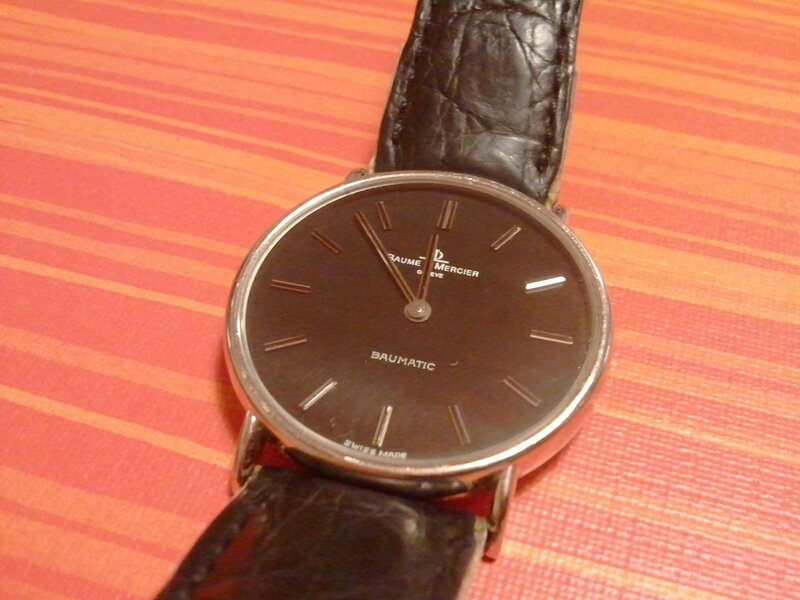 This was the watch on the day I got it. 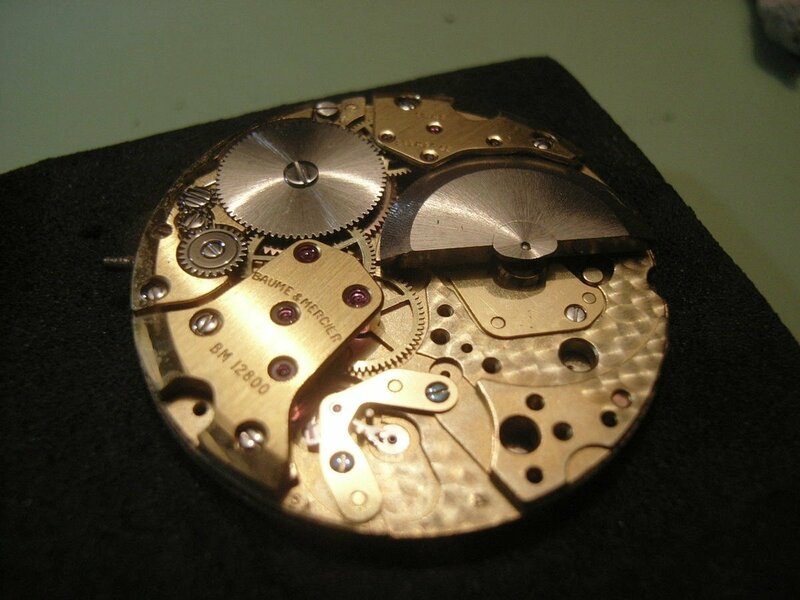 Inside a very well finished Baume et Mercier BM12800 movement which is originally a Buren 1280 microrotor movement. 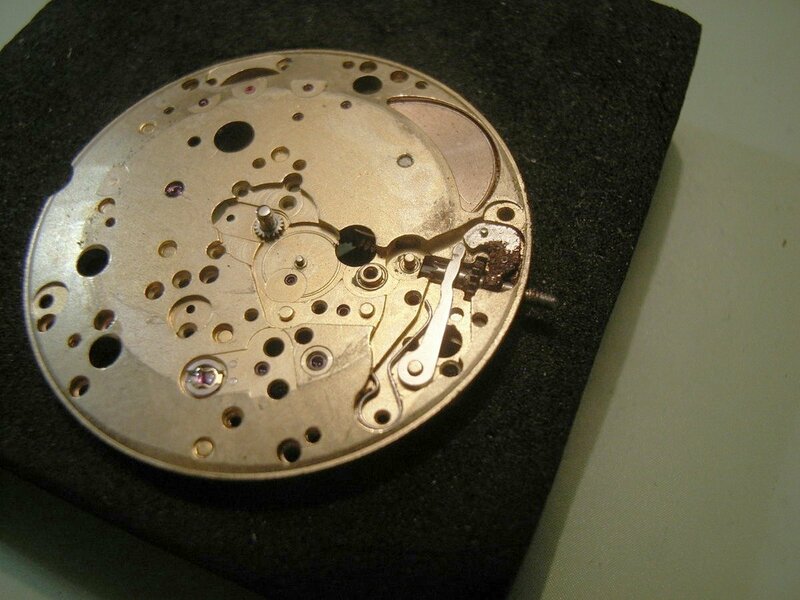 Here the movement removed from the case. 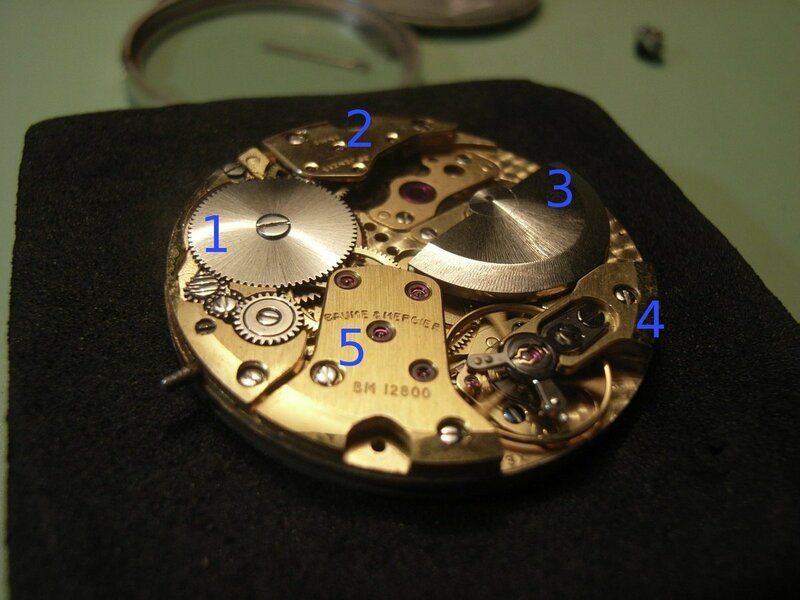 The movement is constructed from several building groups, that is the manual winding and setting mechanism with keyless work and mainspring / barrel (1), the wheel train for the automatic winding (2), the microrotor which drives the latter (3) and the balance wheel with anchor escapement (4) which slowly releases the power of the mainspring over the going train (5). 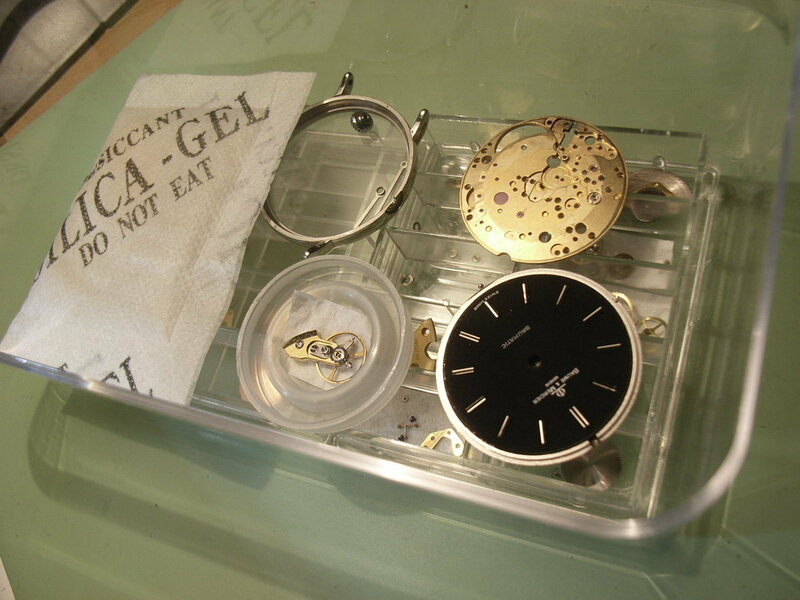 Balance wheel removed. Although barely visible here, the screws of the anchor bridge have been blued. A design which is just as helpful (to remember their correct position) as it is decorative. 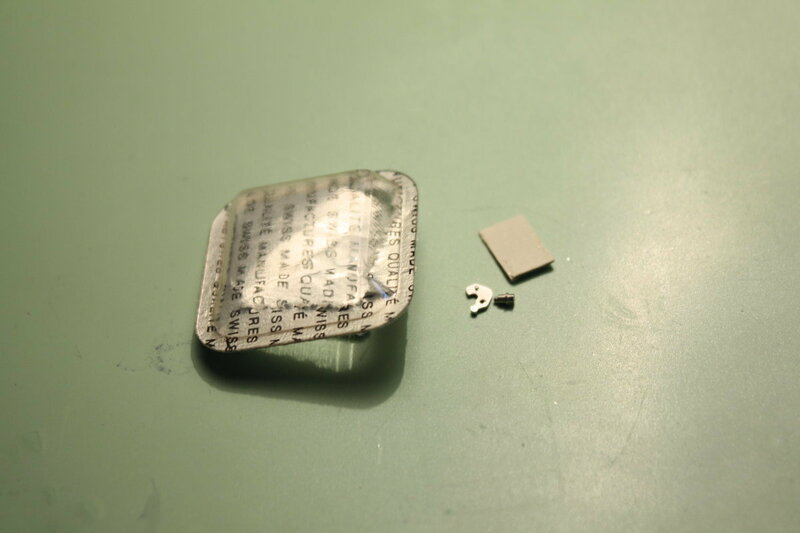 Above, the disassembly of the going train. 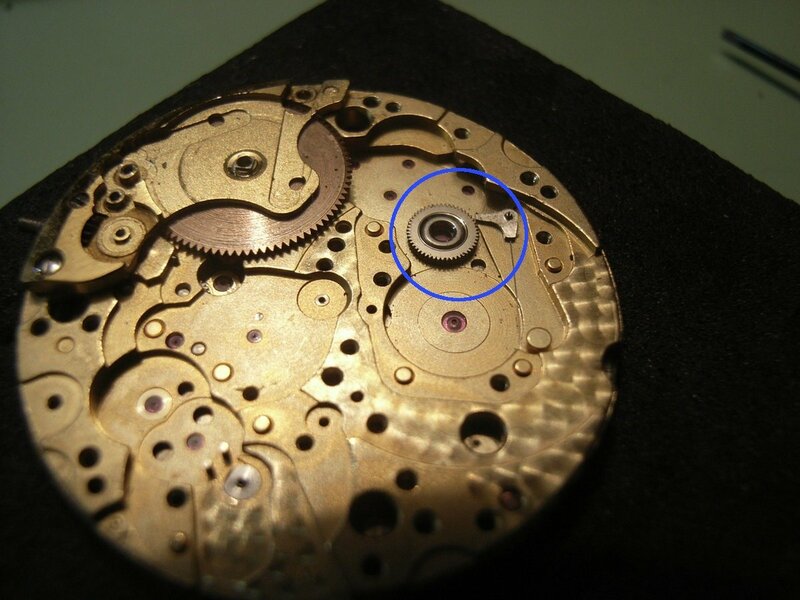 There is no second hand in the 1280 movement - the simplest version of the late Buren microrotor movement series (the blue arrow shows the position were the center wheel pinion would sit in a more complex version, e.g. Buren 1321). 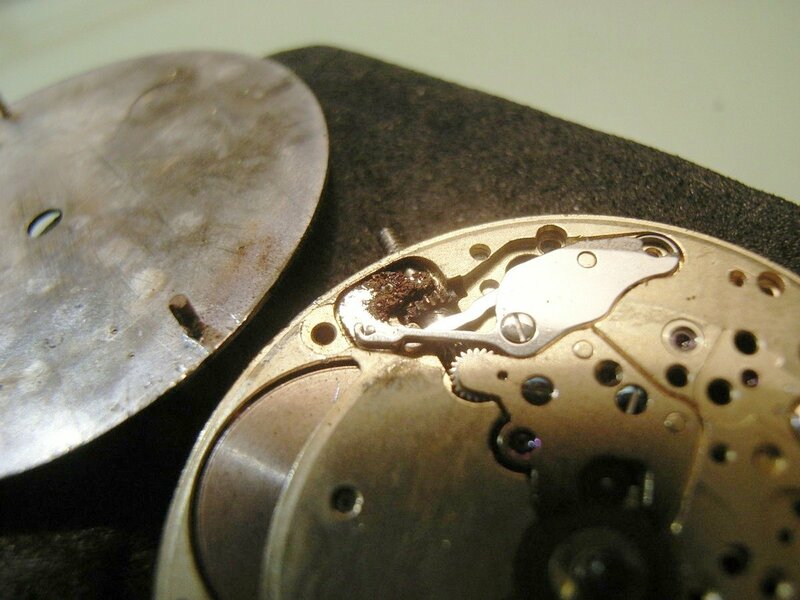 ...rust inside the keyless work. 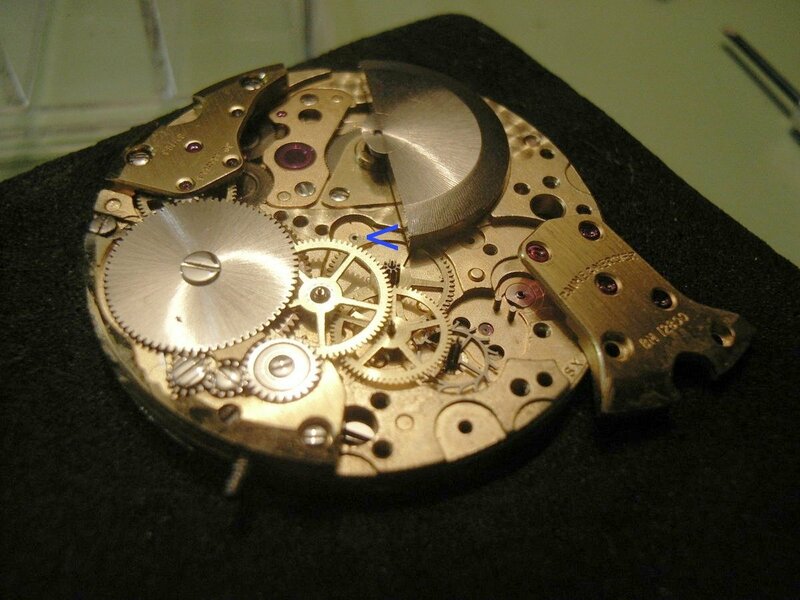 The Keyless work and motion work (hour wheel already removed to expose the canon pinion...the latter is missing a hole for a central second). 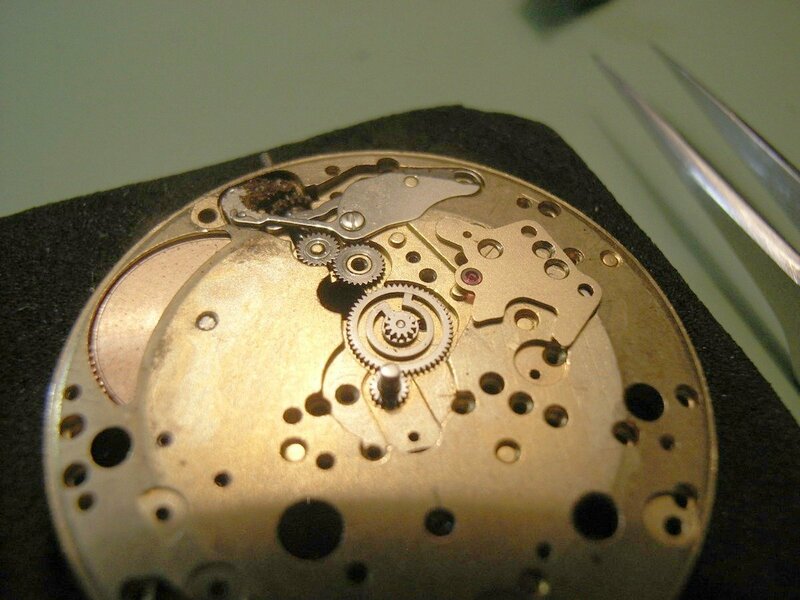 The inner workings of the keyless work. 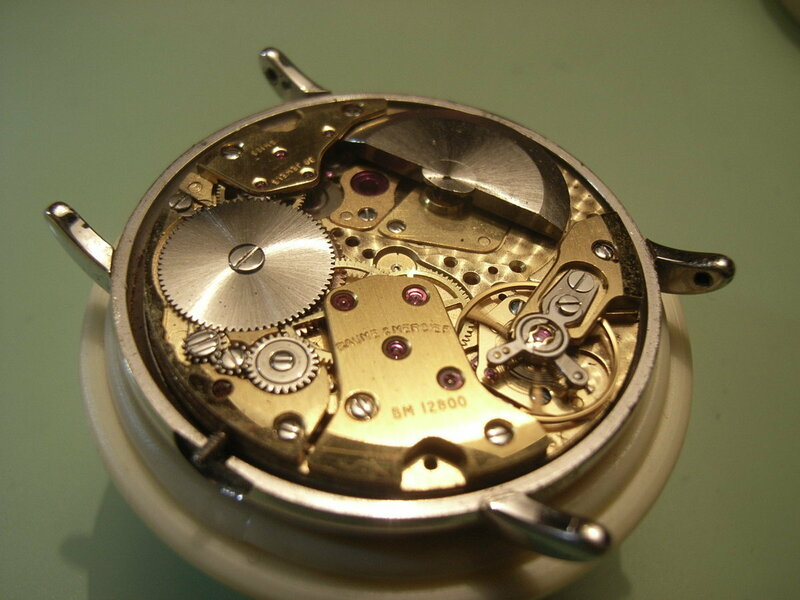 Both, the setting lever and the winding pinion are not repairable and need to be replaced. The underside of the barrel bridge before rust removal and cleaning. 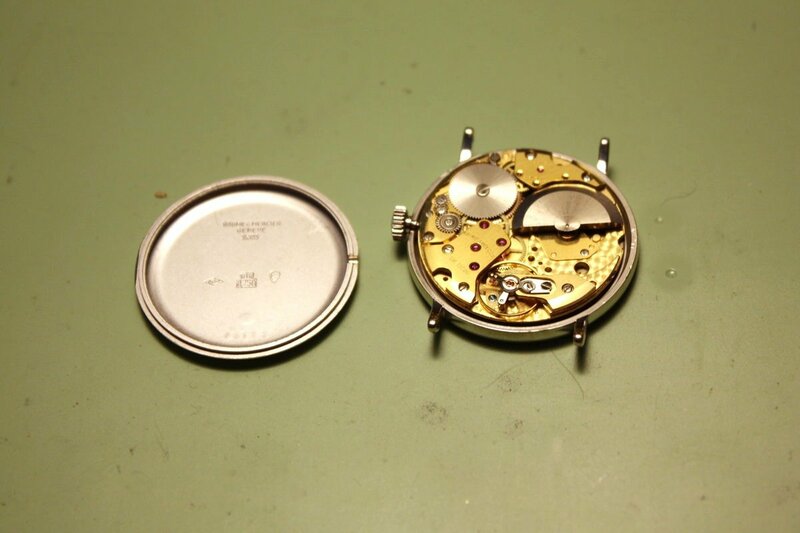 The completely disassembled movement before cleaning above and cleaned below. Above you can see the movement after cleaning with the new setting lever on the left. 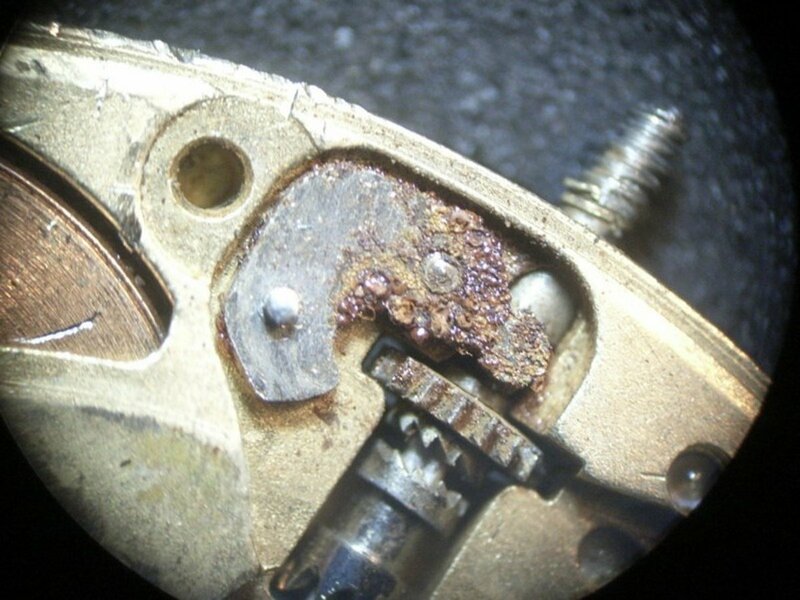 The original setting lever had been destroyed by massive corrosion. 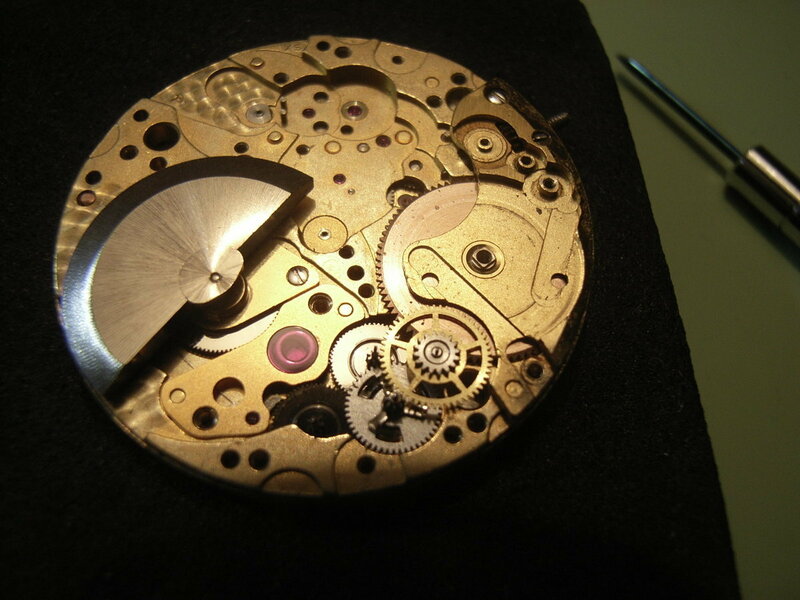 The mainspring barrel and the sliding pinion back in place. 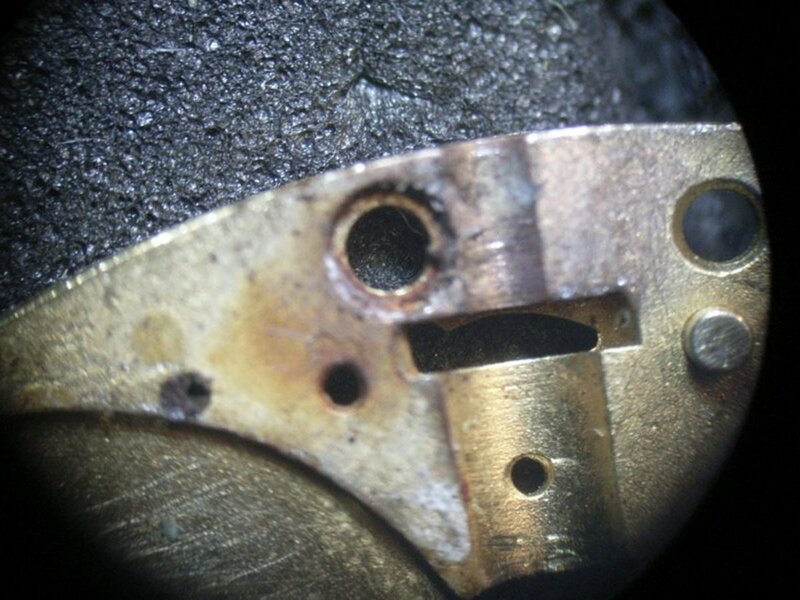 The microrotor and the barrel and sliding pinion bridges back in place. 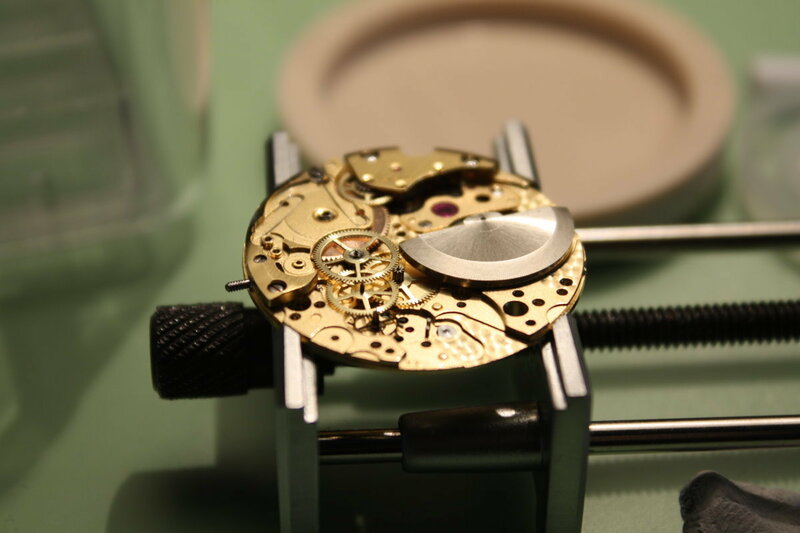 The sliding pinion floats on a thin film of oil between two big jewel discs and it is either coupled to one or another of two switching wheels depending on the rotatinal direction of the rotor. 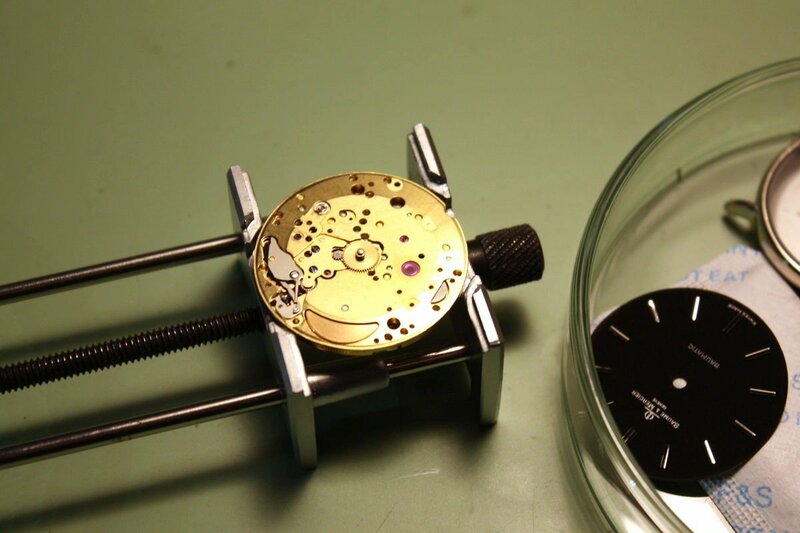 Thus clockwise and counterclockwise rotor motions can both wind the mainspring (I recommend John Davis´ great article on timezone.com for further reading). 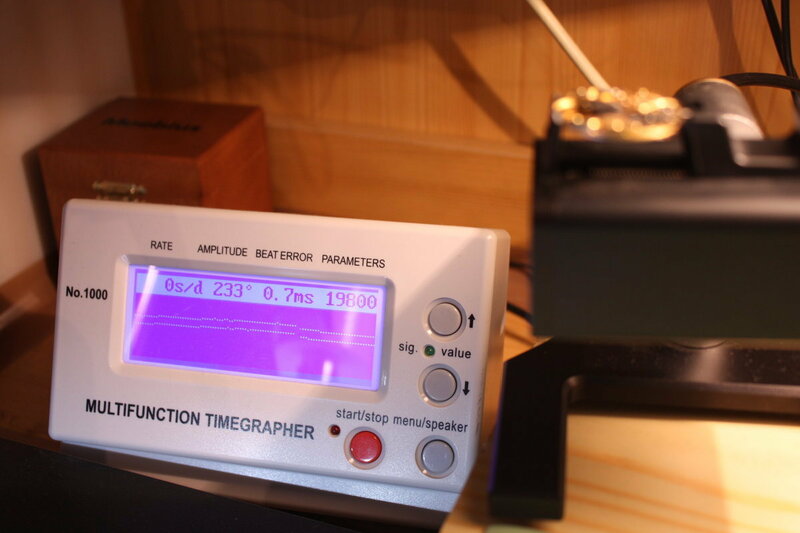 Above, a first test on the timegrapher after just a few turns of the automatic rotor...the movement looks like a good performer. 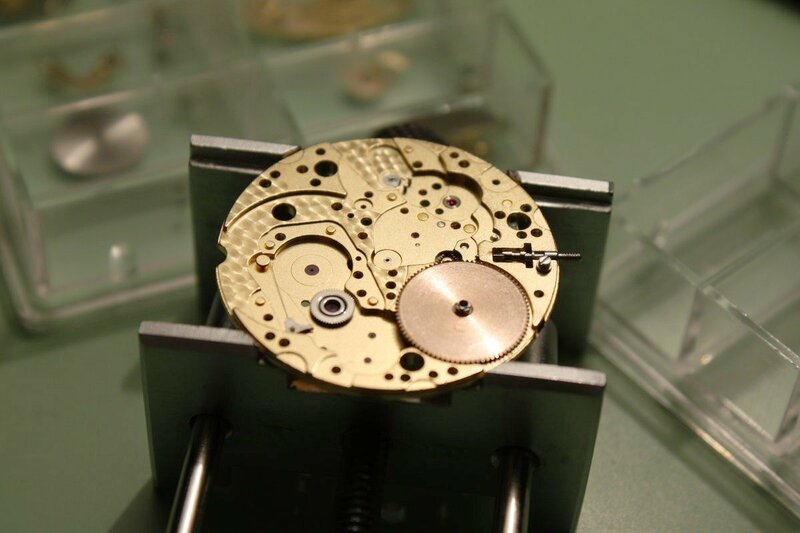 A fully wound mainspring should allow for a very good amplitude and accuracy. 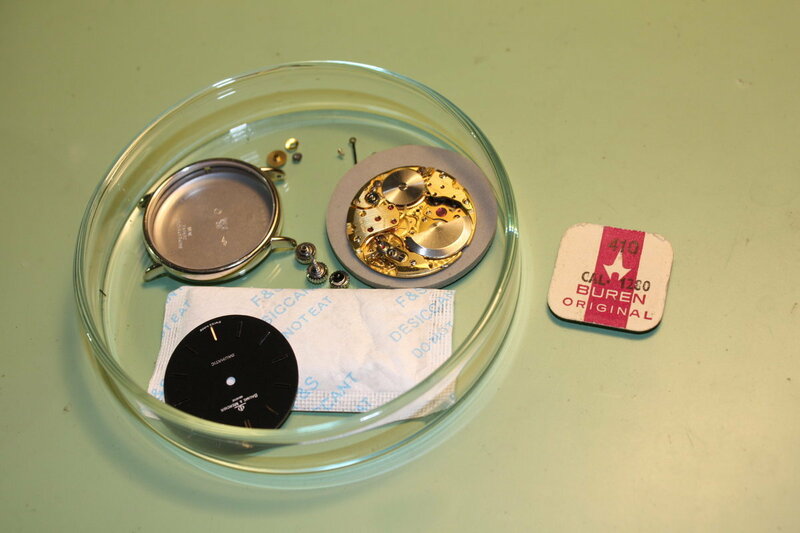 In the middle of my petri dish, two replacement crowns and on the right the replacement winding pinion. 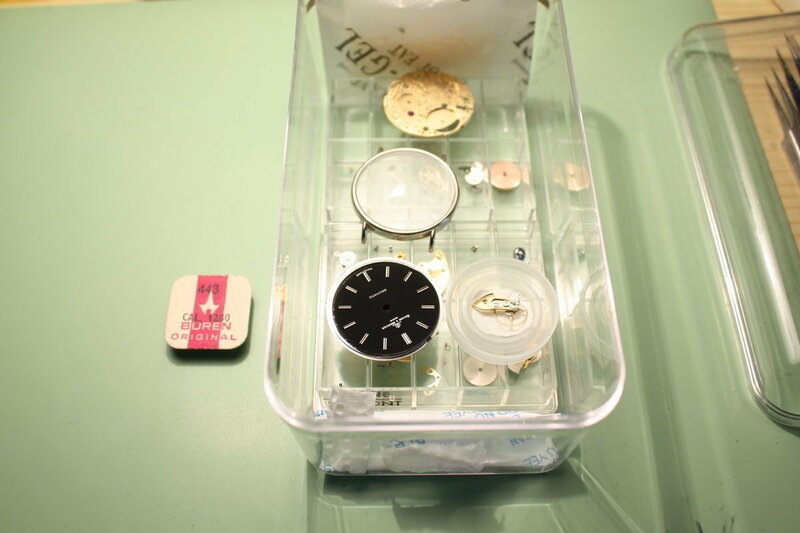 The latter was quite hard to get and I want to express my gratitude to Stuart Mills and his great watch parts shop for helping me in completing this project. 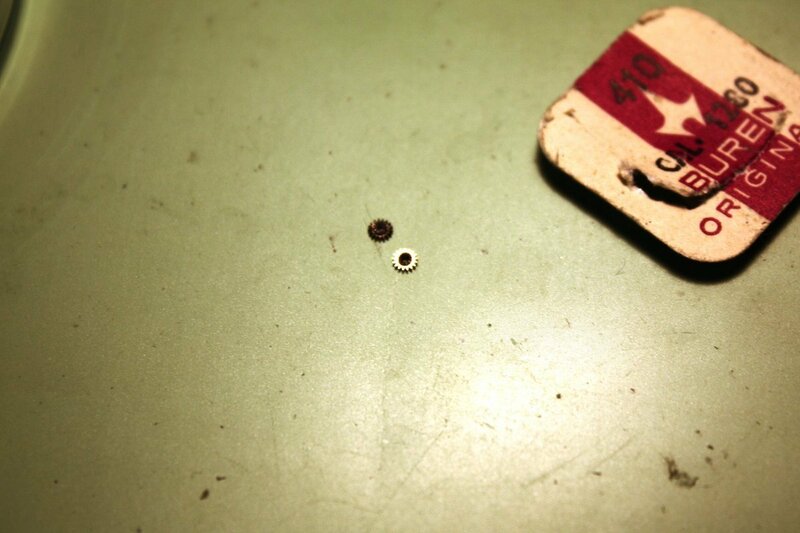 The old rusted winding pinion next to the shiny new one. 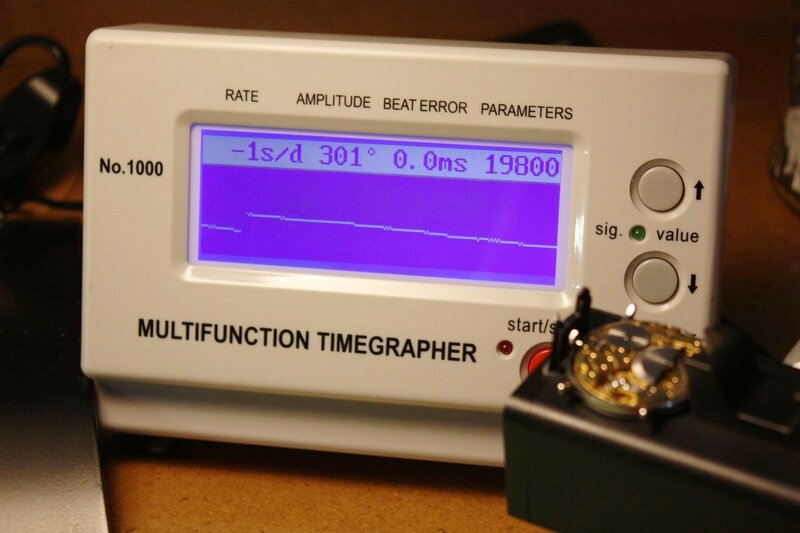 With a now perfect amplitude and its excenter regulation the movement allows for chronometer grade performance (okay the frequency of 19800 beats per hour should probably be higher for that). Preparing to recase the movement. 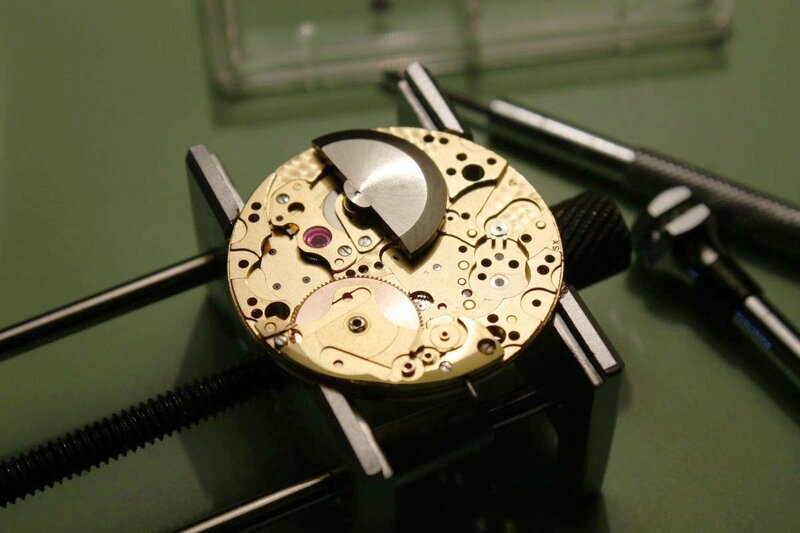 Sadly the case does not really protect the movement against the entry of dust and water (I honestly do not understand why they put such a great movement in a case like that - it should have a screw-down caseback and sealed crown in my opinion...). 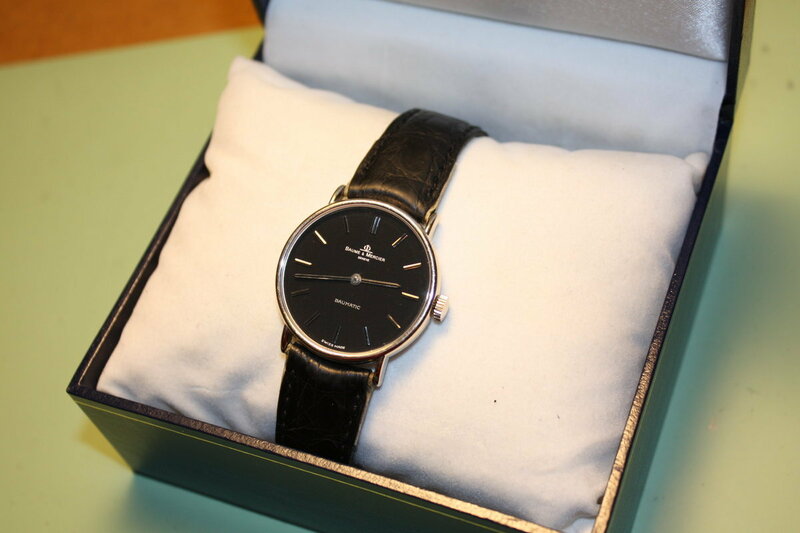 Wearing the watch in a cold or humid environment is an absolute no go...nevertheless it still looks great as you can see in the final picture.